A beautiful handmade titanium and copper infused band made by hand. 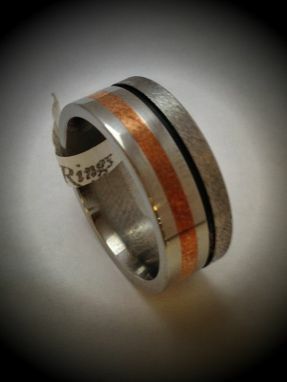 This beautiful band is made as a wedding band and can be stylized for gemstones and/or diamonds. The ring is awesome. There is no activity updates unless asked for them. I gave him a Date specific timeframe. He promised he could make it no problem. It was late. So if buying from Sergio leave yourself extra time. He does respond to messages which was good. I believe he made a honest effort to get me the ring on time but it was 2 days late. Like I said though the ring is exactly what I wanted. I would buy from him again.